Mixed Draft Archives | TOUT WARS! Tout Wars Mixed Draft 2019 Tonight! Check out the live draft board here. Follow along on SiriusXM, with Colton and the Wolfman, Kyle Elfrink and Ray Flowers. The live chat is live! Drafting commences at 8pm sharp! [Mar 5, 6:44 PM] admin: Hey all. The chat is live. Todd Zola will be more moderator than I will because I (Rotoman) am drafting. [Mar 5, 6:47 PM] Tim McLeod: What do you think, Todd. Aaron Judge or Bryce Harper there for me at #14? [Mar 5, 6:47 PM] admin: Definitely the gloaming here. [Mar 5, 6:49 PM] Tim McLeod: You're forcing me to use that google thingie already, Peter? [Mar 5, 6:49 PM] admin: My question: Why is Rudy Gamble "Ross?" [Mar 5, 6:49 PM] admin: With the first pick for his second consecutive title. [Mar 5, 6:51 PM] admin: The board is showing names now. [Mar 5, 6:52 PM] ToddZ: I'm coming at everyone from the little room with workspace at the Pjoenix rental car return. Good times. [Mar 5, 6:52 PM] Tim McLeod: Still in Phoenix? [Mar 5, 6:52 PM] admin: How was the game today? Any insights? [Mar 5, 6:53 PM] admin: Jesus. [Mar 5, 6:54 PM] admin: Evening. [Mar 5, 6:58 PM] admin: Two minute warning. [Mar 5, 7:00 PM] admin: Rudy is taking his time with No. 1. [Mar 5, 7:01 PM] admin: Hmm. Autopicked Trout. Wonder if he wants that back. [Mar 5, 7:10 PM] Rick Bonitzer: yeah that's ridiculous! [Mar 5, 7:11 PM] Tim McLeod: and will he run this year? [Mar 5, 7:13 PM] ToddZ: What risk? [Mar 5, 7:17 PM] Rick Bonitzer: yikes. redact! [Mar 5, 7:21 PM] Albert Richards: Love Realmuto I think he is looking at .285 and 25+ HR's this year…. [Mar 5, 7:24 PM] admin: I might have taken Severino, except the only reason he dropped to me was the MRI. [Mar 5, 7:25 PM] Tim McLeod: How far does Kershaw fall? [Mar 5, 7:35 PM] Rick Bonitzer: Moose gonna get 2b eligibility? [Mar 5, 7:40 PM] ScottGilroy: Why no team names on the top? [Mar 5, 7:44 PM] ToddZ: I think someone in the room was unaware the pbulic isn't viewable and reported "I can see them"
[Mar 5, 7:48 PM] ScottGilroy: How much do we see Severino drop  in drafts? [Mar 5, 8:09 PM] ToddZ: or better yet, anyone listen to NL LABR and catch my "Peter Brady" act, hitting puberty while being auctioneer? It was quite funny, and embarrassing. Voice kept cracking. [Mar 5, 8:30 PM] admin: Good point. [Mar 5, 8:35 PM] ToddZ: Ray stacking Astros. Good ploy. [Mar 5, 8:41 PM] admin: Hanging out in a car rental lounge doesn't help either, probably. [Mar 5, 8:45 PM] admin: Can water be too expensive in Phoenix? [Mar 5, 8:48 PM] ToddZ: I was just surprised they're charging airport prices here. I planned on getting some when I filled car with gas but the traffic lights were out at 44th and Van Buren -- and that Shell's pumps weren't working, so I scrambled to find a station and it slipped my mind. The intersection looked like something out of the 20s with nicer cars. [Mar 5, 8:48 PM] admin: Blackout? [Mar 5, 8:49 PM] admin: I've had Andrelton Simmons on top of my queue for the last hour. Thanks Scott White. [Mar 5, 8:49 PM] admin: I'm up on SiriusXM to explain my team in 10 minutes. [Mar 5, 9:30 PM] admin: Who has the best team Todd? [Mar 5, 9:32 PM] Tim McLeod: You need some SB, Peter? [Mar 5, 9:33 PM] admin: I'm selling steals! [Mar 5, 9:39 PM] ToddZ: how long is the broadcast, ending 11 or 12 et? [Mar 5, 9:42 PM] Tim McLeod: Thanks, Todd. Great job! [Mar 5, 9:45 PM] admin: Could be a dogfight Tim. [Mar 5, 9:52 PM] admin: Thanks Todd! Have a good trip home. I know that the spelling is different, but any excuse to include a Clash song has to be taken. For the second year in a row, Rudy Gamble of razzball.com has won the Tout Wars Mixed Draft League. Once again, he had to hold off Adam Ronis of Scout.com for the title. I wanted to say that Rudy and Adam are the Red Sox and Yankees of the Mixed Draft League, but that wouldn’t do justice to the size of the field they are besting each year, and the comparison fails because there’s no carryover from year-to-year. Moreover, Rudy made a better analogy in his write-up of his victory—they are Federer and Nadal, with a combined four firsts and three second-place finishes over the last four years. With the win, Rudy vaulted into third place on the All-Time Tout Wars leaderboard, behind only Fred Zinkie and Larry Schechter, despite having played only four years. Thus, Rudy will get another meal named after him at our annual Tout Wars get-together at Foley’s. It’s a good bet that if you ever have leftover Tout Wars currency from that meet-up and it has Rudy’s visage on it, you should keep it so that you can use it the following year. It’s worth noting that Ronis isn’t that far behind on the list, sixth all-time and fifth among active participants, and fellow Razzballer Grey Albright has demonstrated similar strength, following up his 2017 win with another “cash” finish in 2018. If you’re looking to see where I’m on the list, don’t bother. Seriously, it’s embarrassing. Having me write this article is like having Anders Jarryd or Manuel Orantes compare themselves to Federer or Nadal. 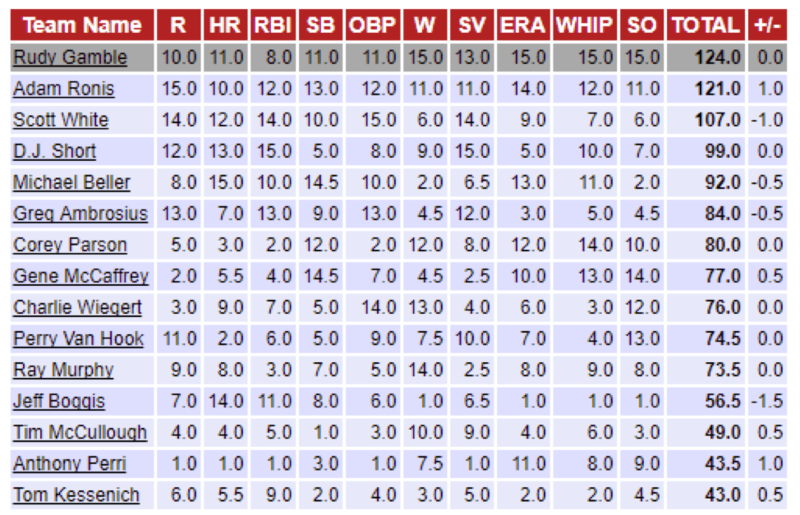 The first thing that jumps out is Rudy’s utter dominance of the pitching categories. He won four of five categories outright and finished third in saves. He did this despite getting only 25 starts from his first pitcher, Noah Syndergaard, who he took at the 2-3 turn. Unlike many of his competitors, he backed up Thor with a second ace, getting Aaron Nola at the 4-5 turn. 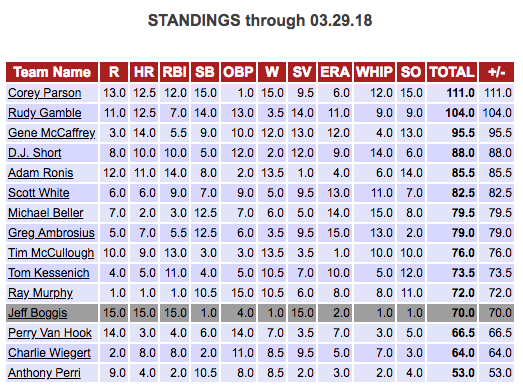 Two great starters aren’t enough to dominate the starting pitching categories, however – he had to hit on the slippery mid-round starters to succeed, and he did that in spades by getting Charlier Morton in the 13th and Blake Snell in the 15th rounds. One might be tempted to dismiss those picks as windfalls – but I think that’s underselling the skill in picking in the mid-tiers. Moreover, because he had that second ace, he was less reliant upon ‘hitting’ with all of his mid-tier SPs. Obviously, there are so many landmines that he could have gone with (and in one case, in Round 12, did go with, in Jon Gray) instead of Morton and Snell – just looking at the draft grid, some disastrous alternative picks in that range included a lot of injuries (Danny Salazar, Garrett Richards, Taijuan Walker, Dinelson Lamet) and underachievers (first-half Cole Hamels, Chase Anderson, Aaron Sanchez, Jake Odorizzi). Rudy was able to combine all that top end starting pitching with quality contributors late in the draft, too – getting significant contributions from Eduardo Rodriguez, Hyun-Jin Ryu and Tyler Skaggs, the latter two in the reserve rounds of the draft. Rudy might not have won saves, but he got two solid closers in Felipe Vazquez and Raisel Iglesias that weren’t ever a threat to lose their jobs. 2018 was a really frustrating year to chase saves – plenty of closers lost their respective jobs, but often their replacements weren’t all that stable, either. 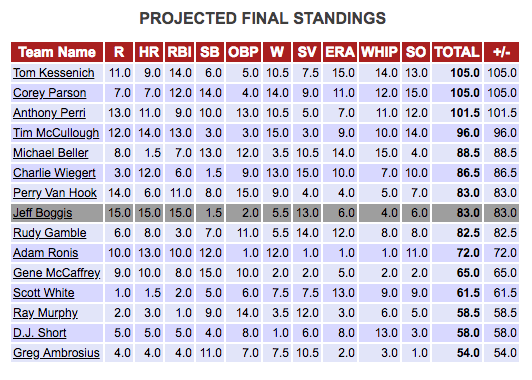 Iglesias was Rudy’s first “value pick” at 9.1 – and it had the added bonus of preventing a disaster in Delino DeShields. Turning to the hitting, once again most of Rudy’s value came from the draft rather than through trades or the waiver wire. Starting out with Mike Trout is great, especially in an OBP league, and then he hit perfectly at 3.1 with Christian Yelich. After that, he had a number of solid players but few breakout hitters (at least compared to the year before, when he nailed Tommy Pham and Whit Merrifield), though he got great values with Shin-Soo Choo (16.15) and Michael Brantley (19.1). It wasn’t the proverbial “perfect draft” for Rudy – he had to overcome injuries and suspensions from Kevin Kiermaier (10.15), Steven Souza (11.1) and Jorge Polanco (14.15), for example. But he avoided the critical early-round disasters, which is so important in a format like this. He also invested very little in scarce positions. Catchers were a disaster in 2018, but with his catchers coming in Rounds 17 (Mike Zunino) and 28 (Bruce Maxwell), any shortcomings there weren’t that damaging. Can Rudy be stopped? All signs point to no, but you should tune in next spring and of course read up at Razzball to find out! Tout Wars Mixed Draft 2018 is Finished! It was a super fast draft, completed in less than three hours. Four hundred and thirty five players were selected. Todd Zola barely had time to spell the names right in the spreadsheet. You can see the spreadsheet, by round and by position, here. Read all the comments @toutwars on Twitter. Author adminPosted on March 7, 2018 March 15, 2018 Categories About Tout Wars, Data, Mixed Draft, News2 Comments on Tout Wars Mixed Draft 2018 is Finished! Tout Mixed Draft is Underway! The Draft is underway. Somewhere out there SiriusXM has promo codes so you can listen in for free for the next three days without any sort of registration. I’ll post if I can find them. But they’re out there. And there is plenty of chatter on Twitter. Look for @ToutWars or #MixedToutDraft. Tout Wars Mixed Draft 2018 Is Tonight! Meet the Touts! Participants listed by draft order. Follow along with the live spreadsheet here. We hope to see you on Twitter with the #mixedtoutdraft hashtag, on the Tout Wars Facebook page and the SiriusXM Fantasy Facebook page. Tout Wars kicks off its season with the 15-team Mixed Draft league on Tuesday night, March 6 at 8:00 PM ET. The draft will be covered live on SiriusXM Fantasy by Glenn Colton, Rick Wolf and Jeff Erickson. Keeping in mind this is an OBP league, Gamble cited Mike Trout as his reason for wanting the first pick. Was he on the up-and-up? Scott White from CBS Fantasy hopes so, as he elected to slide to 1.12, wanting the option of an elite arm, depending on how things go. Baseball HQ’s Ray Murphy was prepared to opt for the back end of the snake, but when the second pick fell in his lap, he decided not to overthink things and start near the top. 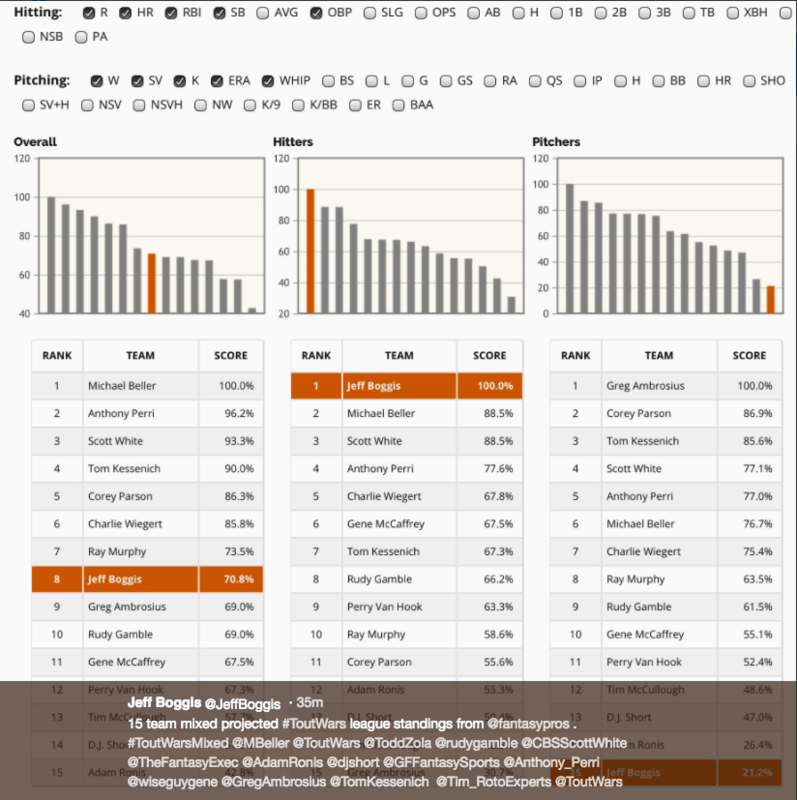 Tim McCullough from Rotoexperts and Greg Ambrosius from NFBC/SportsHubTech parlayed mid-pack finishes into Top-5 picks, saying they want a shot at the best available player left on the board. After examining the results from the recent FSTA and Mixed LABR drafts, CDM Sports Charlie Wiegert used the 7th choice to slide to the 11th pick. 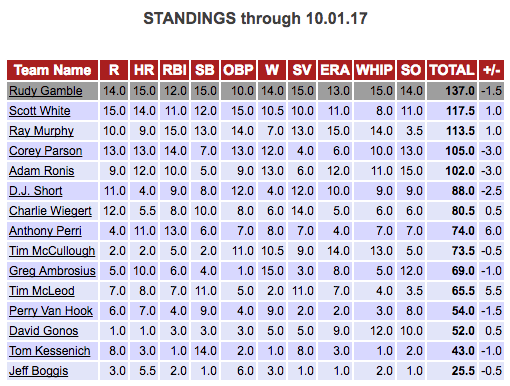 One spot later, Anthony Perri from Fantistics/Insider Baseball chose to pick 14th, feeling the end of the round is optimal for OBP leagues. While others were jockeying for early or late starts, Fantasy Football Empire’s Jeff Boggis was perfectly content to be left with 1.07, in a great spot not to miss out on a run. So far in early drafts, the consensus top-two picks are Trout and Jose Altuve. However, after that, over ten players have been selected from the three-hole, helping to explain the motivation behind the Tout Mixed Warriors selections. This promises to be a wild 2018 campaign, with a myriad of approaches as everyone has their sights on wresting the championship from Rudy Gamble. Next week we’ll introduce you to the 15 combatants, a day in advance of Tuesday’s festivities where you’ll be able to follow along and comment. How To Follow Tout Wars Mixed Draft Tonight, March 7! The live spreadsheet is here. Colton and the Wolfman are covering the draft from 8pm to Midnight tonight on SiriusXM. Rotoman will be talking about the draft live on the Tout Wars Facebook page. Tim McLeod will be chatting from inside the draft room on his Facebook page.